A 17-year-old man was punctured by a wooden stick that was soaked in floodwater. He sought medical advice and received antibiotics to prevent wound infection. 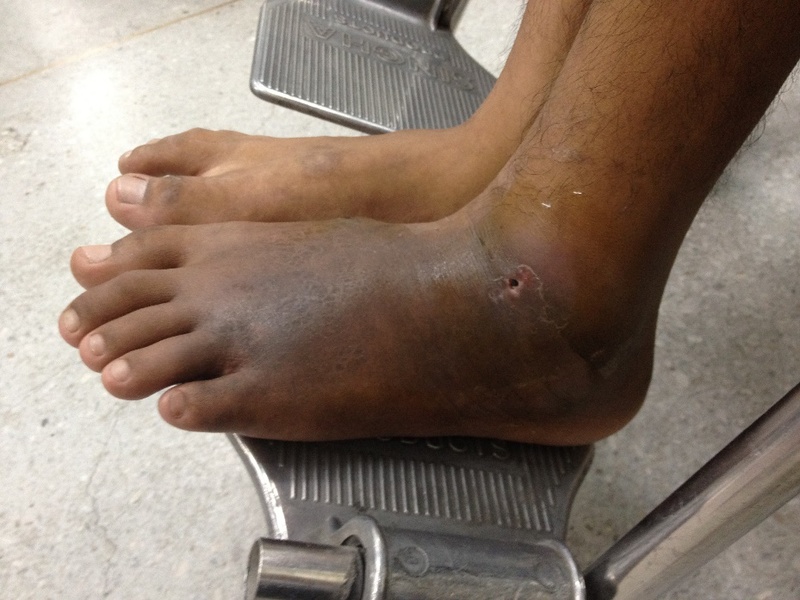 One month later, his left foot became swollen and the puncture site developed into a chronic ulcer (Figure 1). He went to another hospital where he was diagnosed with chronic osteomyelitis of the left foot. Antibiotics were given, but his symptoms did not improve. He underwent magnetic resonance imaging followed by tissue biopsy of his left foot. Histopathologic findings revealed fungal granuloma. His medical history revealed that the patient was diagnosed with beta thalassemia major at 3 years old and received blood transfusion regularly. Because of his underlying disease, human pythiosis was suspected and his serum was tested for antibodies against Pythium insidiosum. The test turned out positive. 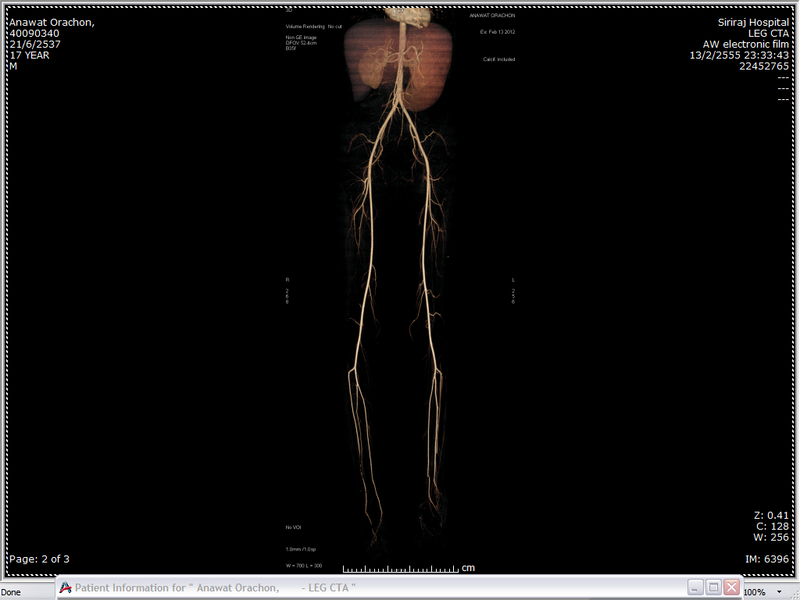 Computed tomography (CT) angiography showed occlusion at the left distal third of the anterior tibial artery and distal end of posterior tibial artery (Figure 2). He was then treated with Pythium immunotherapy and itraconazole in combination with terbinafine, and his left leg was amputated. Pythiosis is a difficult-to-treat infection in animals and humans caused by a water mold – a fungus-like organism named Pythium insidiosum. The clinical presentation of human pythiosis can be classified into three forms: systemic or vascular; cutaneous; and ocular.1 Patients at risk for acquiring Pythium infection include those with underlying thalassemia or hemoglobinopathy, although ocular pythiosis usually occurs in apparently immunocompetent hosts. The most common form of human pythiosis is vascular pythiosis, which is the most lethal form. Vascular pythiosis causes medium to large arterial occlusions, usually in the lower extremities, and can extend to involve the aortic bifurcation. Cutaneous pythiosis presents with a painful, subcutaneous granulomatous, infiltrative lump or ulcer on the arms or legs. It may present as acute necrotizing cellulitis. Ocular pythiosis normally presents as corneal ulcer or keratitis. The overall mortality of human pythiosis is approximately 40%.2 For the patients who survive, however, most lose their limbs or eyes. Diagnosis of human pythiosis may be done by using an immunoassay to detect anti-Pythium antibodies.3 Histopathology, polymerase chain reaction (PCR)4 and culture can be performed on surgical tissue for definitive diagnosis. Therapy for human pythiosis involves surgery, medical treatment and immunotherapy. However, as medical treatment may not always be completely effective, radical surgery is the main therapeutic intervention: limb amputation for patients with vascular pythiosis; and eye enucleation for those with the ocular form of the disease. Approximately 90% of patients with vascular pythiosis require limb amputation for lifesaving treatment.2 Similarly, 80% of those with the ocular form undergo eye enucleation for radical treatment. For medical treatment, saturated solution of potassium iodide (SSKI) or amphotericin B plus flucytosine may be used in localized cutaneous pythiosis, but these are not effective in systemic or vascular pythiosis. Although their clinical efficacy is still inconsistent, the combination of itraconazole and terbinafine has shown synergy in vitro and is currently recommended for medical treatment of systemic pythiosis.5 Finally, immunotherapy with Pythium insidiosum antigenic extract has been reported to have some efficacy for treatment of systemic forms.6 Further study of pythiosis treatment is warranted to seek for more effective treatment modalities for improved outcomes of patients with Pythium insidiosum infection. 1. Krajaejun T, et al. Clin Infect Dis 2006;43:569-576. 2. Sermsathanasawadi N, et al. J Vasc Surg 2016;64:411-417. 3. Krajaejun T, et al. Clin Vaccine Immunol 2009;16:506-509. 4. Kosrirukvongs P, et al. Southeast Asian J Trop Med Public Health 2014;45:167-173. 5. Argenta JS, et al. Antimicrob Agents Chemother 2008;52:767-769. 6. Wanachiwanawin W, et al. Vaccine 2004;22:3613-3621.